A few storms may produce heavy rain, large hail, and damaging winds. Another round of showers and t-storms will likely trek across the region this afternoon and evening. Severe weather is not expected. 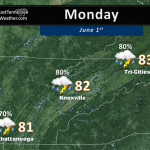 Thunderstorms are likely across the region for Tuesday. A few may be strong to severe. Skies will remain mostly sunny over the weekend, with highs reaching the upper-80s. 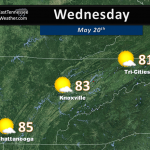 Sunny and dry today, cooler with a slight chance of showers for Thursday. We'll see another round of showers and t-storms this afternoon and evening. Severe weather is not expected, but heavy rain is possible. Clouds will move in Friday and linger through the weekend along with thundershowers. Severe thunderstorms will likely impact the region this evening. Damaging winds, large hail, and isolated tornadoes are possible. 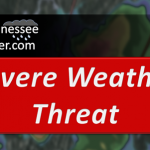 Damaging winds is the primary threat, although isolated tornadoes are also possible. Damaging winds, large hail, and isolated tornadoes are possible this Saturday.